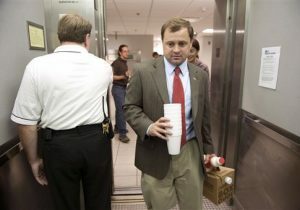 Former congressman Tom Perriello, a Democratic candidate to be Virginia's governor, said during a campaign event that he viewed the 2016 election as a "political and constitutional September 11," according to video footage obtained by the Washington Free Beacon. "The election of Donald Trump was a little bit like, you know, a political and constitutional September 11 for us, if I can be honest," Perriello told the crowd in Afton, Virginia, during a campaign event last week. Perriello's comparison was made during a discussion of "how big of a moment this is" for the country. "The Democratic establishment, in my mind, has not understood how big of a moment this is," Perriello said. Perriello, a former congressman who was unseated after just one term, announced in January that he would be running for governor of Virginia. He is currently attempting to position himself as a more "progressive" option than Lieutenant Governor Ralph Northam, who was previously believed to have a clear path to the party's nomination in the race. Perriello's campaign did not immediately respond to requests for comment on the comparison. After the video surfaced, Perriello wrote on social media that he won't make the comparison again. "I regret the comparison and apologize," wrote Perriello on Twitter. "Won't do it again." He is not the first person to compare the election of Republican Donald Trump to the terror attacks of September 11, 2001, which killed nearly 3,000 and injured thousands more. The day after the election, Mother Jones editor in chief Clara Jeffery wrote that she hadn't felt as "gutted since [she] watched the Twin Towers fall." Sports reporter Bart Hubboch was fired by the New York Post for a tweet comparing the election of Trump to the terrorist attack. David Crosby of "Crosby, Stills, and Nash" said that the election was "about as bad as 9/11, or maybe worse, because the consequences are much longer-reaching." Families of victims that died on September 11 lashed out against the absurdity of comparing an election to the attacks. "My husband died on that day saving lives," said Carmen Suarez, whose husband was an NYPD officer that was lost in the terror attack. "What did Trump do? He just got elected for President." Jim Slevin, president of New York's firefighters union, said that anybody drawing the parallel between the election and the terror attack "has clearly lost their mind." Although Perriello served just one term in the House of Representatives, he managed to emerge as a liberal favorite due to his loyalty to President Barack Obama, who traveled to Virginia to campaign for Perriello in the days before he was defeated. Perriello was given the reins of the Center for American Progress Action Fund after his election loss, and held the position until he was appointed by Obama to a position at the State Department in 2014. He held his first major campaign rally over the weekend, stating that he is "not scared to be bold." UPDATE 1:20 p.m.: This story was updated to include an apology from Perriello.